DC Comics did some big things to Superman and Batman over the weekend. But, once again, it feels like Wonder Woman’s getting the short end of the stick. This past Saturday, The Man of Steel’s relationship to Lois Lane turned decidedly less warm. And the Free Comic Book Day one-shot called Divergence also revealed that there’s a big change coming to the main Batman series, too. There was also a Wonder Woman-centric chapter in that comic, but it didn’t quite have the same wow moment as the others. The most troublesome thing about the Divergence story that happens on Wonder Woman’s island home of Themiscrya is that she wasn’t in it. Oh, sure, it’s a flashback to the night she was born and the events in it were centered in her mythos. Nevertheless, she wasn’t front and center like Superman and Batman were. This story has more to do with the big Darkseid War event that’s about to start in Justice League than anything going in Wonder Woman’s book. 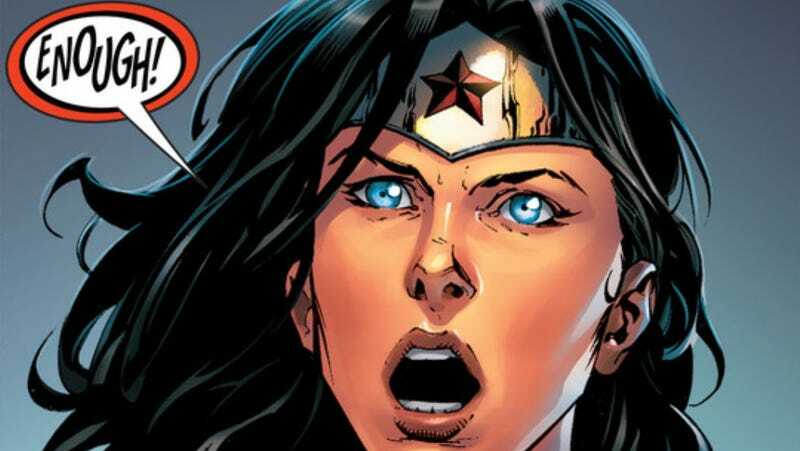 And while that storyline’s going to be focused on Wonder Woman, it’s not clear if she’ll be getting the kind of immediate buzz of interest that Superman and Batman are getting from their plot developments. Darkseid War’s probably going to be a publishing event in the most hidebound, dogmatic superhero style. Teasers are hinting at shocking twists and turns, with heroes doing things meant to surprise longtime readers already familiar with their histories. Batman turning into a New God?! Green Lantern possibly killing someone?! Cyborg getting Shazam’s powers?! That sort of thing is all well and good but it seems to be exactly what DC’s coming titles—gesturing at a more experimental array of creators and tones—will be moving away from. DC’s in a tough spot with Wonder Woman, which unfortunately seems to be the status quo all too often. The critically acclaimed team of Brian Azzarello and Cliff Chiang left months ago. Their exit ended the beautifully drawn, idiosyncratically imagined take on Greek god family drama that made WW one of DC’s best books since the 2011 relaunch of its entire line. The creators on the book now are Meredith and David Finch, a married couple that’s got one of superhero comics’ most popular artists as its male component. They’re a few months into their first story arc, which is called War Torn. The proceedings have been louder, more sturm-und-drang than Azzarello’s quieter, smouldering Greco-Roman dysfunction. The Finches have given Wonder Woman an existential crisis and threats from within her home to deal with. Diana’s the goddess of war now and it’s been an open question as to whether the power that comes with her station is making her more vicious. It’s that last plot point that best illustrates the compromised nature of the spotlight that Wonder Woman might enjoy. The big reveal of the Divergence story was that Darkseid’s daughter was born on Themiscrya on the same night as Wonder Woman, now grown up to be a fearsome warrior villainess named Grail. All of the Darkseid War foreshadowing so far seems to indicate that she’s going to be facing off against Wonder Woman. It’s the same plot point done twice over in a span of months: an evil Wonder Woman. And hitting it in two separate titles smacks of poor co-ordination and a dearth of ideas. On one hand, it’s not quite fair to say that DC Comics doesn’t have a sense of how much Wonder Woman matters to their fictional universe. She’s an eminently recognizable icon, after all. But it’s the sense of how she matters that feels most gummed up. She’s been dating Superman for the last little while and the pairing has sometimes felt like something that was supposed to happen after years of fan fiction willing it into being. The thing that worked best about the Azzarello/Chiang run was that Diana was pretty much in her own pocket of the DC Universe. Having her date Superman—and these new storylines she’s going to be part of—changes that, and not necessarily for the better. The current Wonder Woman arc isn’t terrible. The ideas in War Torn are strong but the dialogue hits on the themes in the most aggressively heavy-handed fashion. Torrents of text obscure the art and it barely feels like any of the elements has room to breathe. This feels like the work of creators trying to find their footing. Meredith Finch’s current tenure is the first time a woman’s been writing Wonder Woman in a good, long while. That’s the kind of thing that sticks out by virtue of its embarrassing uniqueness. The creative class of superhero comics is so denominationally homogenous that it’s a coup for a woman to be doing Princess Diana’s adventures. But I get the sense that it’d be problematic if DC editorial undermined the Finchs’ creative choices and pissed off a superstar artist in the process. And it’d be even more awkward to have Geoff Johns—the Justice League writer who’s also one of the company’s big bosses—re-jigger his storyline to accommodate the new kids on the block. In the end, it’s Diana (and her fans) who suffers, as she’s pulled along two paths by her gatekeepers. In terms of announced status quo changes, yes, Wonder Woman has a significant costume change coming. That shiny armor and those big, scary blades look just perfect for going to war. For being War. But for all the promise of the upcoming Darkseid War storyline, it still feels like it could run into the trap of not actually being about Diana. She might merely be the device through which the plot runs. And it might not leave her with the kind of deep-core changes that will have fans talking about her again, as they did with Superman and Batman. The big thing that’s focused on Wonder Woman doesn’t feel like it’s about her, which is yet another bummer for DC’s most famous heroine.